Shakespeare on the Common starts this Friday, 7/18 and they'll be featuring "As You Like It." Free Shakespeare, a public program of the Citi Performing Arts Center, will return for an extended run on Boston Common this summer. The popular midsummer tradition of free Shakespeare under the stars will return to the Boston Common for three weeks with Citi as the new corporate presenting sponsor for the program. 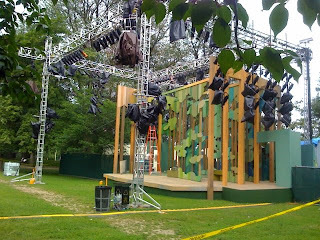 Directed by Steven Maler, founding artistic director of Commonwealth Shakespeare Company, As You Like It will be staged at the Parkman Bandstand on Boston Common July 18 through August 3, 2008, with two dress rehearsals open to the public on July 16 and 17. Bust out the picnic blankets and lawnchairs. Shakespeare on the Common is always a great family and/or date event to go to. And from what I recently heard about the NYC Shakespeare in the Park - ours is way more accessible. Apparently in NYC you hafta stand in line for hours and wait for tickets. Whereas for us, we just show up a little early to try to stake out a nice viewing spot. PS. Picture is from this morning - looks like the set setup is coming along nicely. Click (here) for show times and other details. 1 Response to "Shakespeare on the Common Starts This Week - 7/18"
They had their site built for free by students at the Center for Digital Imaging Arts @ BU. Sweet deal for a non-profit!